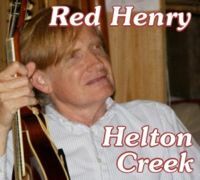 Red Henry: Helton Creek Seven years after his first mandolin CD, here's Red's new project. Mostly recorded in Nashville and featuring a cast of excellent pickers, Helton Creek includes original and traditional bluegrass numbers, great but little-known fiddle tunes, songs and tunes by Bill Monroe and Frank Wakefield, and one of Red's great stories. Includes: Helton Creek, Toy Heart, Flood of '57, Shawnee Land, Yellow Barber, Lucky Charms Waltz, Bitter Creek, High on a Mountain, and many more. If you'd like the physical CD use the "Buy CD" button to the left. If you'd like to download individual tracks, or the entire album, please visit CD Baby or iTunes. Click here for the complete liner notes. Read the California Bluegrass Association's review of Helton Creek here. Read the UK correspondent Richard F. Thompson's review from the Bluegrass Blog here. Then there is a full-band sound on the title cut “Helton Creek,” “Squirrel Hunters,” Henry’s “Hundred and Six Star Rag,” Frank Wakefield’s “Alone and Forgotten,” and many others. This fuller sound typically includes Red Henry’s spouse Murphy Henry and/or his uncle John Hedgecoth (former banjoist for, of course, Bill Monroe) on banjo, and daughter Casey Henry on bass and banjo. One of the nicest among these is the Stanleys’ “Flood of ‘57” with Red and Murphy on vocals all the way through. Mark and Sally Wingate provide fiddle and banjo on several fine, not generally well-known, fiddle tunes, including “Yellow Barber” and “Birdie.” Also quite effective are the Monroe instrumentals, “Lockwood” with some very pleasing instrumental work all around (especially Chris’s guitar break) and a rousing “Rawhide” with mandolin work by both Red and Chris and a great up-the-neck banjo break by Murphy.